Reference number for this case: 12-dec-54-Sannat. Thank you for including this reference number in any correspondence with me regarding this case. Mr. Sauthon, from Evaux les Bains in the Creuse, was a witness of an observation he had shared with Raymond Veillith, founder of the ufology magazine Lumières Dans La Nuit. "It seems that a person from Sannat, village at 10 kms from Evaux, returning at her home around 5:15 a.m., coming from a wedding that took place in my hotel, told the Mayor of Evaux on Sunday, December 12, 1954, at 5:15 a.m. she saw two luminous discs, one of 40 cm in diameter and another smaller, the indicated direction would be substantially the same as the other days, ie the West. I leave the entire responsibility to the Mayor of Evaux who reported it to me, as I have not seen this person since." Raymond Veillith noted this in typewriting, sent a copy to Donald Keyhoe who headed the large ufology group NICAP in the United States, and his note was finally mailed to me in the 2000s by the late ufologist Richard Hall; the note is thus reproduced below in this file. 11 or 12 Dec. 54 - 05:15: Two luminous circles of different diameters ("Catalogue des Observations de MOC des origines à 1956" QUINCY). 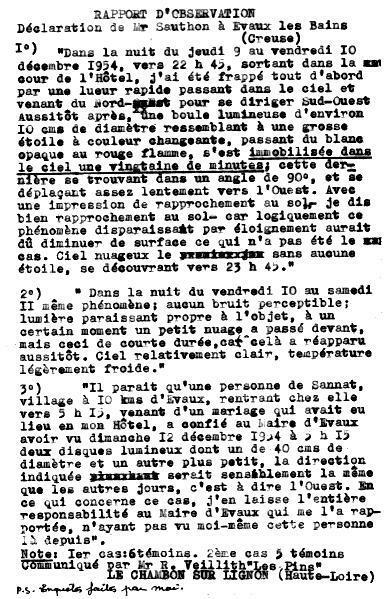 The website indicates that on December 12, 1954 at 05:15 in "Sauthon Evaux", France, "An unidentified object was sighted, but with an appearance and behavior that most likely would have a conventional explanation." It so happens that I was able to get my hands on the real primary source, [rv1], as a carbon copy of a note typed by Raymond Veillith, founder of Lumières Dans La Nuit magazine in February 1958. What a journey! This note, and others, was in a batch of documents received by NICAP director Donald Keyhoe in the USA. Raymond Veillith used to type his notes in several carbon copies and had sent a duplicate to NICAP. Late ufologist Richard Hall had inherited it, but nothing had been done because nobody could translate these texts. Shortly before his death, Richard Hall sent me all this, among other documents in German, Spanish, Portuguese, knowing that I could translate them. This note by Raymond Veillith thus crossed the Atlantic in the 1950s, and crossed it in the other direction four or five decades later, to be finally published here. [rv1] "Déclaration de Mr Sauthon à Evaux les Bains (Creuse)", note by Raymond Veillith, France, my personal file. [---] "Catalogue des Observations de M.O.C. des Origines à 1956", by Guy Quincy, France. [ld1] Note by Mr. Catinat, in the ufology magazine Lumières Dans La Nuit (LDLN), France, #165, page 32, May 1977. [---] Computerized catalog by Jacques Vallée, France. 0.1 Patrick Gross December 14, 2003 First published. 1.3 Patrick Gross November 28, 2016 Additions [io1], [ld1]. Explanations changed, were: "Not looked for yet. Airplanes, meteors..." Addition of the Summary.